I'm a big fan of Cory 'TheSpoondog' Spooner, from my extensive time playing UT Jailbreak. He's always found ways of laying out maps that promote 'interesting' results. CTF-DeepSprinta is no exception. The level takes place in an underwater facility, with sharks surrounding you on the outside (is it too much to ask for sharks with laaaazer beams strapped to their heads?) Inside, you're presented with stairs, lifts, a small underwater section with a Redeemer, and several ways to get to and from each flag base, complete with twisty corridors, an open section in the middle with a couple of Z-axis tiers, and sniping towers. Simply mah-vel-ous layout. This level is big enough to require at least a 4 on 4 match, and you could probably go 6 on 6 for some real fun. Great layout makes for exciting action and good balance between offense and defense. Lighting makes sense in most of the map and is pleasant to deal with, bots are tough and aren't afraid of using the Redeemer, item/weapon placement is well done, map is fun to play. Middle room FPS slows down considerably, is quite noticeable and detracts from the rest of the level. Some physics issues, as noted by Geddy in his user comments, but they don't really detract from gameplay. Looks like we got ourselves a weiner here. CTF-DeepSprinta should see lots of server face time, and is bound to be an online favorite, if you have the hardware to withstand the center room. I say, upgrade already. Recommended! New custom music taken from mortal kombat, detailed architecture, appropriate textures, and consistant theme makes this a fun play. The author found a good use for those windows in Phobos & Orbital that are difficult to surround with BSP. The layout is loosly farmiliar, nothing really special was done, but it works great and bots play on it well. There are only two technical issues that I noticed...first, in one of the hallways there is are windows that are blocked off by gates, but should you shoot at it, your rockets/bullets/etc will travel right through. I know, I know, thats not a big deal at all. The other problem is the central room of the map where FPS drops considerably. Though it remains playable, its difficult to ignore. Overall, a good play with some very minor problems that is well worth the download. If I could give this map a 7.5 I would, but the rating system will only allow whole numbers. If it weren't for the fps dip in the middle of the map it would bet an 8 (and to be honest there ddoesn't seem to be that much detail in the middle to warrant such a loss). Looks very clean, plays well. Although the layout isn't especially original, that also means you can't go wrong with it. Tried and True. I'm doing an LE version of this map by demand, at some stage, which will tend to some gameplay issues and hopefully help the FPS in the middle area, for those interested. The playability is very good, the visuals are not breathtaking, but above average. The author did a great job on optimizing the map for slower computers. It doesn't play too fast like some of the other UT 2003 CTF maps...I think it plays more like the original UT. And that's a nice change from all the other maps. Everyone should get this one ! i like the atmosphere, albeit it gets simplistic at times. my main beef is the part where you enter the water to get the superweapon; go to the glass floor above it and look down and you'll see what i mean. it needed some static mesh(es) surrounding it, making it look...well...solid! layout could use a tad more z axis, but that is just opinionated. some people prefer z axis more than others. Clean map that is well organized and plays really well The meshes are all used properly and fit the scheme of the map. Sharks are cute. Framerates are a little low in the central area, not sure why. Solid map in every ways, nicely done and fun to play. A simple CTF map that is very fun. yahhh spoonie nice map! i like the reptile soundtrack!! no complains about looks, layout or atmosphere.. I love dem fishies too! Really cool conversion of Sprinta! I like the theme, and I gotta say, the sharks look so much better in this game - they look like actual sharks to me. I hope to see some more work from ya soon! This map reminds me of CTF-Orbital from UT. You could swear that although they don't look exactly the same, the basis (and some design) are very similar. Otherwise, this map is very good for CTF. I've found myself having to go through the hallways looking around each corner because the bots play this map well, and two managed to kill me out of nowhere while I was carrying the flag. For a medium-sized team, this map works. I had one of the best games ever playing this map! The bots were good and the map flowed well. Loved the theme. Kudos! 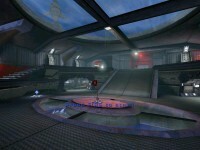 The layout reminds me of CTF-Orbital (which is no bad thing), it's a nice map with a long lasting appeal. Love this layout. I also enjoy the atmosphere on this.